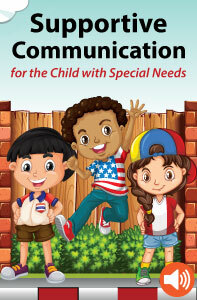 Supportive Communication for the Child with Special Needs is a new 1-hour audio continuing education (CE/CEU) course that provides practical tips for helping parents to communicate with their child who has special needs. This audio course provides instant access to download the mp3 audio file, the course handout, and the CE test. Successful completion of the online CE test (80% required to pass, 3 chances to take) and course evaluation are required to earn a certificate of completion. This course is offered for .1 ASHA CEUs (Introductory level, Professional area). ASHA credit expires 12/31/2020. ASHA CEUs are awarded by the ASHA CE Registry upon receipt of the quarterly completion report from the ASHA Approved CE Provider (#AAUM). Please note that the date that appears on ASHA transcripts is the last day of the quarter in which the course was completed. Professional Development Resources is also approved by the Florida Board of Speech-Language Pathology and Audiology, the Ohio Board of Speech-Language Pathology and Audiology, and is CE Broker compliant (courses are reported within a few days of completion).